When it comes to home renovations the best return on investment of any part of the home is found in the kitchen. Improving your kitchen can return 75% to 100% or more of your initial investment. But before you dig into your toolbox or head to the home improvement store it is helpful to know what design choices offer the best value for your investment. Implementing the right elements is often the difference between getting the price you want when you hit the market and having to slowly lower your asking price. A common mistake people make when looking to revise their kitchen is focusing too much on the money spent. Having a budget is very important, but you want your money to be spent productively. Installing expensive Lazy Susans or wine racks are not smart monetary moves if your cabinets are falling apart. The first step is to evaluate the status of your space. Focus on aspects that draw the most attention: counters, cabinets, appliances and wall color. Counters and cabinets take up the most space in your kitchen (typically 60% to 70%) and get the most use. Reach for a plate or glass, chop food or rest a dish—it’s critical your counters and cabinets are up-to-date in form and function. Homeowners typically view appliances for function first, but a strong aesthetic appeal will help your space stand out to buyers. Kitchens are the first thing realtors show prospective buyers. This is your first impression. Are your cabinets in dire need of an update? Before you grab your sledgehammer, consider refacing the cabinets. With this the existing frame or skeleton and layout stays intact. Everything else (75% of what people see) is replaced. Adding new doors, drawers, and hardware will only run you between $2,000 and $6,000. A full tear down can cost double or even triple that amount. Of course, a new fresh coat of paint and new cabinet jewelry might be all you need to breathe new life into your cabinets. Creativity is key when you are remodeling on a tight budget. A popular, cost efficient, option is wood refinishing. You cabinets stay the same, but the urethane and stain or paint is stripped away and sanded clean. Then new layers are added. You can expect to pay between $3.30 and $3.70 per square foot on a wood refinishing job, and it’s a project for even the most novice DIYer! A project you might want to leave to the experts is replacing your countertop. And you’ll be glad you left this to the pros because a new countertop offers 70% ROI or more. But it needs to be granite. People love granite for its durability and aesthetic look. Not only can you slice food right on its surface (if you do not mind scratching the polish), but you can also choose from a plethora of colors and patterns when picking it out. Be sure to have your kitchen colors locked down before picking your countertop color. You can pick a darker granite color and let it pair with lightly colored walls to be a focal point of contrast. Light colors like whites and yellows are quite in vogue these days. They are inviting, reflect plenty of natural light, and make spaces look bigger. The same cannot be said of dark or “strong” colors like deep blue or green. Use these colors as accents, but make sure they match your countertop. Don’t worry about matching your walls with your appliances. When buying new appliances, there is one aesthetic that reigns supreme: stainless steel. Nothing is sleeker or cleaner than this metal sheathing, making it the most desirable material among homeowners. Buyers too! People want to know you home is up-to-date. Stainless steel embodies contemporary aesthetic and reliability. Real estate experts agree that a kitchen remodel should cost between 5% to 10% of your home’s estimated resale value. In an average US city like Chicago this is anywhere from $12,000 to $24,000 as homes in 2016 are now selling for an average of $240,000. By applying this formula to your kitchen remodeling budget and also incorporating the right design elements into your kitchen remodel you can ensure that your house sells above the fair market value of other homes in the area. This happy homeowner in Rhode Island worked with Kitchen Views designer Lisa Zompa to design her dream kitchen. When choosing a designer, find someone who listens to your needs and is flexible enough to work with your schedule and your budget. A good rapport is key. You also want someone well-versed in the array of products available to find the best fit for your project. We have a wide selection of cabinetry, countertops and decorative hardware at our disposal here at Kitchen Views. You deserve a variety of options based on what your particular needs and wants might be. 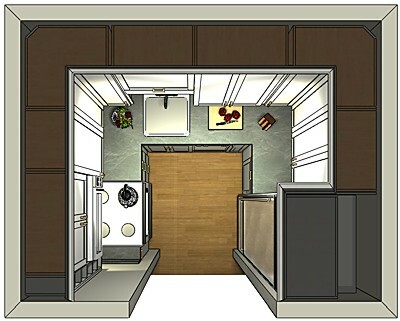 Our designers can create the kitchen of your dreams at just about any price point. Kitchen Views has a wide range of products, from stock cabinets that arrive in a few days to fully custom made to order. It’s also important to find someone who can balance your needs along with your wants to make sure that everything comes out well. It can be too easy to get carried away with a particular dream aspect of a kitchen, and end up with the budget becoming too stretched to fit in the essentials! You want a designer that understands the limitations of a budget and finds creative solutions to reach your goals. There are so many products available for kitchens today that the sheer quantity of choices can become overwhelming. Your designer should help you to navigate the sea of seemingly endless choices and offer you not just pros and cons. They should also explain how the price points and particular styles and characteristics of different materials fit into your overall plan. A professional designer can provide you with ideas that you may not have previously considered. At Kitchen Views, we’re not going to push one or two particular products at you for the sake of selling. You give us your ideas and we offer choices. In order for the finished room to meet your needs functionally and aesthetically, it has to be a team effort. Good kitchen design is about transforming your ideas into reality, while being both realistic and efficient at the same time. If you’ve been frustrated in the past by having this or that trendy option pushed on you, or you are having trouble finding someone who grasps your unique situation, give Kitchen Views a call and we’ll exceed your expectations.